Dragonfly TLSO is the first release in our TherAlign™ brand of code-verified orthotic systems. It combines ‘warm-and-form’ spinal bracing with the wearable therapy of a TheraTogs undergarment in a customized, integrated orthosis. 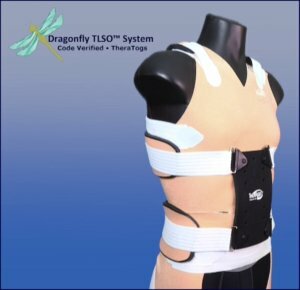 Dragonfly TLSO supports the spine and trunk with a lightweight, rigid panel – forming a custom spinal support anchored on the pelvis for superior torso core stability while training the neuromotor system into more functional alignment using a TheraTogs undergarment. A clinician first warms the Dragonfly brace using a low temperature(165°-180° F). Warming takes 8 – 14 minutes , depending on the heat source and the size of the Dragonfly. Meanwhile, a TheraTogs undergarment is applied to the wearer’s hips and torso, which is cozy, breathable and delivers somatosensory input, flexible stability, and attachment sites for muscle-assist strapping. Once warmed, the Dragonfly is then applied to support the spine with a lightweight but rigid panel, custom-formed to the iliac crests and upper trunk, to anchor spinal alignment support on the pelvis. You can also download the Client Selection Guidelines for Clinicians here. The Dragonfly system’s unique (and patent pending) double-wing design anchors on the pelvis to deliver optimal stability, comfort, and torso support, with minimum weight and bulk. The warm-and-form materials allow the clinician to create a truly custom truncal orthosis in minutes – and later adjustments for fit and comfort can be made with a heat gun. Pfeifer M, Begerow B, Minne HW. Effects of a new spinal orthosis on posture, trunk strength, and quality of life in women with postmenopausal osteoporosis: a randomized trial. Am J Phys Med Rehabil. 2004 Mar;83(3):177-86. Available in infant-to-adult sizes, the Dragonfly TLSO has been code-verified by PDAC for HCPCS Code L-0456 and L-0457. As a reimbursement-ready, code-verified product, the Dragonfly TLSO system is primarily available through O&P providers who have authorized billing relationships with payor agencies. Contact your therapist for a referral, or see our Provider Locator map to find a provider near you who is experienced with TheraTogs. You can also contact Customer Service for assistance: info@theratogs.com or 888-634-0495, option 1. TherAlign™ systems are FDA Class I medical devices intended to be issued by and applied under the supervision of a licensed healthcare practitioner engaged in neuromotor or sensorimotor retraining. The TherAlign Dragonfly spinal support unit is comprised of GoldTone fabric, a thermoplastic core, and a polyester foam layer. TheraTogs and TherAlign components are not made with natural rubber latex. TheraTogs and the TherAlign Dragonfly TLSO are protected by US Patents # 8,007,457 and.8,535,256 B2, and Canadian patent #2495769. The Dragonfly TLSO is patent pending in the US. Additional US patents pending.TheraTogs™, TherAlign™, Dragonfly TLSO™, GoldTone™ and TogRite™ are trademarks of TheraTogs, Inc. All Rights Reserved. For more information about the new TherAlign brand of code-verified products contact our Customer Service team at info@theratogs.com | 888-634-0495.